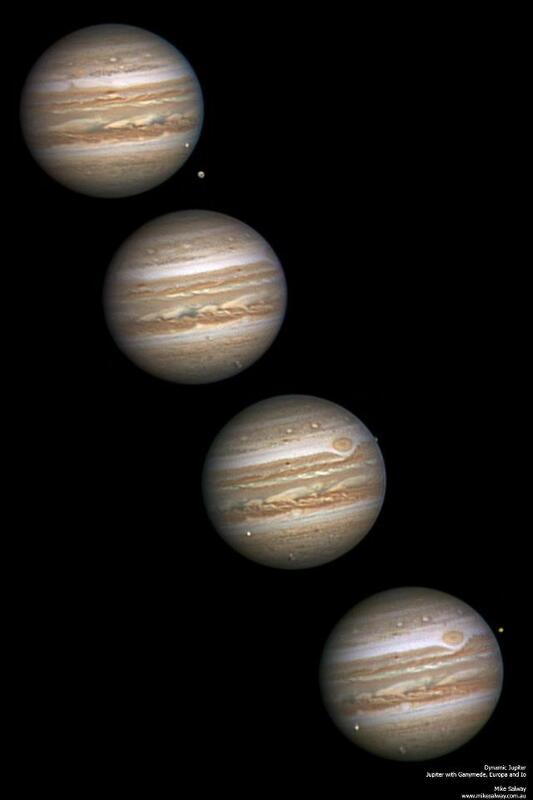 This collection of images of Jupiter was captured by Mike Salway Photography. Pictured here are four frames of a 21-frame sequence captured in 2007 (the full animation can be seen below). You can see two red spots, the first and smaller one being visible near the top left-hand side of the planet in the first frame while the Great Red Spot makes an appearance in the remaining three. In addition, you can see three of the four Galilean moons. Ganymede is the moon on the lower right, Europa is found above Ganymede near the lower right (note, as the planet rotates, these moons move to the left), and Io shows up in the last two frames near the top right. This sequence has made the rounds in the astronomy community and was even the official NASA Astronomy Picture of the Day in March of 2007. Do You Want to Become an Astronaut? Find Out What it Takes!